They don't generally meet the guidelines -- must serve tea, must have seating -- but every now and then the light lunch limo has alighted at a chippy, from Felixstowe to Martlesham via Melton and Woodbridge. Usually these are make-do locations. Today, though, it's a special trip prior to replacing The Boy's phone which went for a swim on holiday. Backtrack to pre-hols times and we were queueing for ice creams at Walberswick, as you do. Behind us was a poshy-washy girl's voice bemoaning her lot in life, namely having to work behind the counter of a fried potato emporium. Not any old pla(i)ce, though, but a better class of fast food establishment with the laid back name of Hot Chip. Given the people who hang out on the Suffolk coast, I assumed this would be somewhere in that London. Not so, said Mr Google the next day: that'll be, er, Norwich. Owned by local aristo Lord Somerleyton, Hot Chip occupies a sweet spot in the city centre. In we go, the four of us, and thankfully a table quickly becomes free. Walls are pleasingly covered with olde worlde local newspaper ads interspersed with HC's self-promotion: they only cook in rapeseed oil, you know, 'cos it's much healthier. Girls go for the Hot Chip Butty, The Boy has a monster of a bacon butty and I take on The Spaniard with "pan-fried chorizo, melting Manchego cheese and quince salsa." Oh yeah. Other options include spicy lamb, tandoori chicken or even a Sunday roast. At £12.50 for our quartet of cartons, it's top value; nothing's over a fiver. Good selection of soft drinks too, including San Pellegrino cans, plus they do coffee. We all give it a big fat thumbs-up. 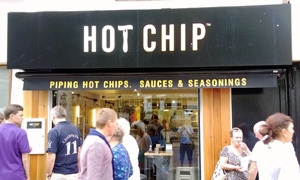 Hey, Hot Chip, come and open up in Ipswich! If it was a car -- Aspid GT-21 Invictus. If they were passing by -- Alexis Taylor.